Intact, with a black weathering crust lightly flaked in areas to reveal a highly iridescent layer. Offered with custom base display stand. Ex: Early European private collection collected during the 1990s; American private collection Measurements. Roman mold blown amphoriskos of pale aubergine glass. The ovoid form of the vessel loosely resembles that of a Roman amphora and is decorated by a pattern of nearly stacked horizontal ribbing. On top is a cylindrical neck with infolded rim and two elegant trailed handles with pinched rounded finials join the shoulders and lip. This is a very rare type with such elaborate handles. Cf: The more common variant lacking such elaborate handle treatment and made with far less articulated mold in E. Stern, the Toledo Musuem of Art. 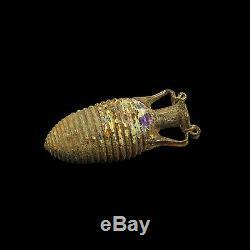 Roman Mold-Blown Glass (Rome, 1995), nos. FOR THOSE SERIOUS ABOUT ANCIENT GLASS COLLECTING: OUR ANCIENT GLASS COLLECTION IS BY FAR THE LARGEST AND FINEST OFFERED FOR SALE ANYWHERE. TELL US IF YOU ARE LOOKING FOR ANY SPECIFIC TYPE, AS THE CHANCES ARE THAT WE HAVE IT. This object is unconditionally guaranteed authentic. It has been legally imported to the U. And is legal to sell under U. Statute covering cultural patrimony Code 2600, CHAPTER 14. A note to our international buyers. These charges are the buyers responsibility. 1 - This item is guaranteed authentic. 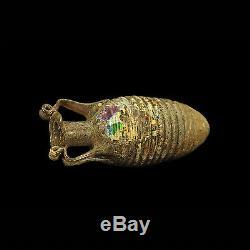 2 - The images, size, and condition in this listing are accurate and for the actual object offered. We are among the top world-wide online ancient art sellers with a physical gallery location in New York City on Museum Mile. We hand-pick every object and make sure it has great eye appeal as well as good upside investment potential. All objects we sell are. Reasonably priced compared to others. Our commitment to you is. It will provide you with valuable information and advice, and after all it is free! Our vast inventory of ancient art includes one of the finest and most comprehensive ancient glass collections ever assembled; it includes nearly every variety of pre-Roman, Roman, and eastern Mediterranean ancient glass. If you have any specific inquiries, please let us know. 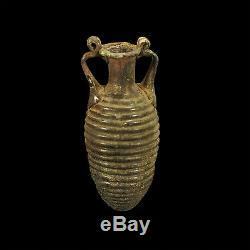 The item "APHRODITE- ANCIENT ROMAN MOLD-BLOWN GLASS AMPHORISKOS" is in sale since Tuesday, October 15, 2013. 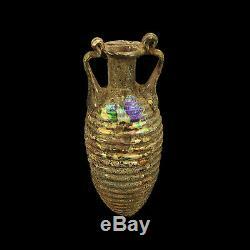 This item is in the category "Antiques\Antiquities\Roman".antiquities" and is located in New York, New York. This item can be shipped worldwide.